Tyre & Sidon - Two of the greatest and most powerful cities of the Bronze Age were the Phoenician centers of Tyre & Sidon. Their economic strength is a testament to the greatness of maritime trade (a fact that Athens would also prove over a thousand years later). A combination of natural defenses and strong city walls allowed them to flourish from the early 2nd millennium to about the middle of the first. Although they did fall under the influence of foreign powers at various times, they were allowed to operate in relative autonomy for most of that period. Egypt, during the New Kingdom, took control of Canaan as a buffer against the Hittite Empire, but Tyre & Sidon were largely left alone to conduct trade. And trade they did. Timber from Lebanon, oil, wine, linen, ivory, precious metals from Egypt, copper from Cyprus and, above all, a purple dye that was made from sea-snails that were indigenous only to the waters of the Eastern Mediterranean. As time passed and empires became larger and more powerful, the two cities came under increasing pressure from foreign powers. The Assyrian Empire controlled them from about the middle of the eighth century BC until its fall in 612, but also left them alone for the most part. But the Babylonian Empire, under Nebuchadnezzar II, was not so accommodating. He attacked and destroyed Sidon in 587 BC and began a siege of Tyre in 586 that lasted 13 years. 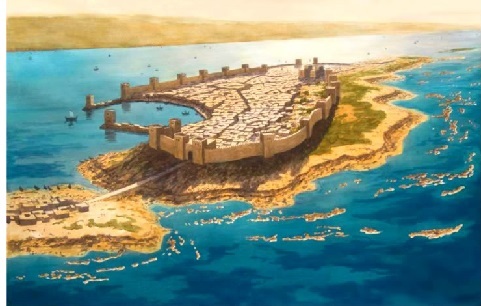 He razed the mainland quarter of Tyre, but it survived as an island city a half mile off the coast. That ended in 332 BC when Alexander the Great famously built a causeway (which survives to this day) from the coast to the island and utterly destroyed it after it refused to surrender to him. Both towns recovered to a degree, but a new city built in Egypt, Alexandria (see Alexandria), by the aforementioned Macedonian king became a major ancient metropolis and doomed the old Phoenician cities from ever regaining their former glory.